Agnes is a 52-year-old woman develops medial-sided knee pain while kneeling during her usual gardening activity on weekends. The knee pain is progressively becoming worse with her gardening activities and has now affected some of her other activities such as hiking and going up and down stairs. She notes a sense of stiffness on occasion and some pain along the medial joint line. She describes pain at night while in bed, which is worse if she sleeps with her knees together touching. Agnes could benefit her condition by seeing a physiotherapist to help her with improved joint mobility. A bracing specialist could help her with bracing options to keep her mobile and active. Pilates and massage could also help with her range of motion, swelling and pain. Getting an MRI on her knee could help her physician provide an accurate diagnosis and treatment plan for Agnes' knee pain. Lastly, consultation with an Orthopedic Surgeon and a Rheumatologist for further advice and testing on her condition may also help Agnes resolve this issue and continue her usual hobbies and activities. 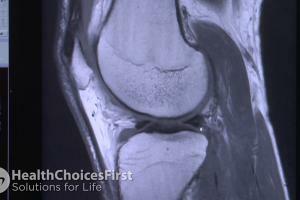 MRI Scans for Knee Injuries and When They Are ImportantAudrey Spielmann, MD FRCP(C), discusses MRI Scans for Knee Injuries and When They Are Important. A radiologist is a physician who specializes in x-rays, CT scans, and MRI's and can help patients determine what the cause of their knee pain might be by interpreting the medical images. A Registered Massage Therapist is a healthcare professional who specializes in helping patients reduce and manage pain, and can help patients who are dealing with knee pain. A bracing and equipment specialist can help fit patients with braces to help manage knee pain, and are trained to educate patients on these devices. 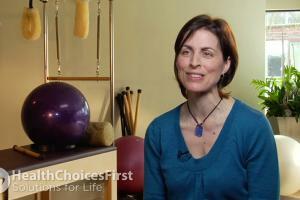 A pilates instructor is trained to teach this fitness system, and helps students develop core strength and stability. Pilates can be helpful for people dealing with various conditions, including knee pain. A rheumatologist is a physician who specializes in treating arthritis and joint pain, along with autoimmune disease. Rheumatologists can help patients manage their knee pain. A sports medicine physician has training to deal with sport or exercise-related injuries, and can help assess, diagnose and treat knee pain in patients. An orthopaedic surgeon is trained to diagnose and treat bone and skeleton-related problems. An orthopaedic surgeon may be consulted in determining whether a patient's knee pain requires more invasive treatment. Conversation based on: Treatment Options for Knee Pain While Gardening " Agnes a 52-year-old with medial-sided knee pain "
Why would her pain be worse if she slept with her knees touching ? Reply to: Treatment Options for Knee Pain While Gardening " Agnes a 52-year-old with medial-sided knee pain "
Knee pain caused by gardening can be caused by a sudden injury like what has happened to this 52 year old women, or an overuse injury, or by an underlying condition, such as arthritis. Treatment will vary depending on the cause as in this case by gardening. Symptoms of knee injury can include pain, swelling, and stiffness which is apparent in this women from gardening. @Karmen MacAngus a physiotherapist can also help you strengthen your knee to reduce pain right ? At 52 it's likely late to start, but one thing I am conscious of is squatting more, and one time it often is appropriate is during gardening. I've read that squatting is a more natural position but in our culture of sitting in chairs for everything, we lose the flexibility. It doesn't look very ladylike! but it can be comfortable if your body is used to being in the position. Squatting is great way to take the pressure of the knee joint and put it into the large quadricep muscles. Always make sure that your knee never goes beyond you toe when you squat. Would using assistive devices like knee pads, gardening mats, etc. 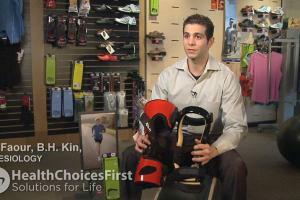 prevent knee pain or simply ease the symptom of knee pain? For instance, if I use assistive devices when I garden at 35, will I not have knee pain at 75? I feel like there is a lot than can be done ahead of time to prevent knee pain as we age. Assistance devices such as mats, knee pads, stools and braces are certainly options for individuals struggling with knee pain from gardening. The causes with gardening are usually either from prolonged compression of the structures in the knee such as the menisci, patella-femoral joint, medial and lateral articular surfaces; prolonged stretch of the knee ligaments depending on the position of the knee joint; or repeated movements that can cause a repetitive strain injury. Advise for the first set of causes would be to ensure that no single posture is sustained for too long - in other words try to modify the gardening activity so that you do not spend too much time in one static position. If the cause is due to repetitive strain, then its very important to address the biomechanics to ensure that the knee is working in the right way. Obviously having good mobility in the knee is also important as others have already addressed. While kneeling or crouching for long periods of time during the gardening, the blood circulation from the quadriceps and hamstring muscles are restrained (stagnated). Cupping therapy and Acupuncture can improve circulation through the knee by detoxing these muscles and restore fresh blood to these large muscles that feed the knee joint. My ankles tend to hurt more than my knees while gardening. I will try adding more stretching to my day. I wonder what stretches are good for knee pain, or for ankle pain? It is important to find out if it is joint pain or muscle pain you are experiencing. A friend kept thinking that she was experiencing muscle pain in her knees, so she took anti inflammatory medication. Since the issue was persistent she visited her doctor and was sent for an MRI. It was determined to be a injury to her joint and she was sent to a physiotherapist to help her with improved joint mobility. It is important that a doctor is seen to determine what is wrong and to ensure you are being treated properly for your injury. I have a wonderful mat that I use when gardening that really helps reduce knee discomfort. I find I get more knee pain at the beginning of the gardening season but that once my body gets used to the position and movement again it adapts and the pain goes away. I also find that Tylenol helps with the pain. Knee pads can also reduce the discomfort I feel in my knees when working on the ground. I have found them very helpful. I started stretching when I was 15. Being over 40 now, I have tried to maintain a level of flexibility that will allow my muscles to work more and my joints to work less as I get older. In my experience too many people view stretching as a winter thing that they do before or after an activity or at the gym. I have always tried to view stretching as a thing I like to do wherever I am. Stretching has so many good attributes and accompanied by a good strength program, should really be looked at as a year round activity. Stretching has so many benefits. People often skip or rush through stretching because it doesn't feel like much work for the most part, and many of us are looking for that quick workout and don't want to spend time stretching afterward. It is amazing how quickly your flexibility can decrease over time - good for you @John for maintaining a regular stretching program! If knee pain from gardening persists, it's best to decrease kneeling and switch to container gardening, where everything will be elevated. I was going to say this...I've been bugging my husband for a few years as I would like him to build me some containers for gardening. For me the problem isn't so much my knees but my back. Costco is also now selling some plastic raised bins. It is my understanding that most of us over time as we age will experience a certain amount of joint pain from Osteoarthritis, but if the pain starts to interfere with normal activities and is constantly there, I would definitely eek out professional help from various professionals for for sure. I would start with my family doctor but would likely also see a physiotherapist on my own. I have self-referred to physiotherapists before, and they really helped me understand the nature and cause of my knee pain. I think visiting your family doctor is important to rule out any other issues, and physiotherapy is key to understanding and managing knee pain. Would a bracing support for the knee reduce the amount of pain one would experience while gardening? My suggestion is to stretch your leg adequately prior to initiating gardening, and take several breaks to stand up and move around. I would also consider using knee pads or a gardening mat so help alleviate the pressure placed directly on the knee. Further, make sure the foot is flat against the ground versus having your toes curled under creating n inappropriate fulcrum at the base of the toes. The last piece of home care advice is if you experience back, knee, or ankle pain consistently when gardening (or doing any activity for that matter), seek out a Chiropractor to obtain a diagnosis of the underlying cause. I would think finding a proper brace that would allow you to kneel for any length of time would be difficult. And uncomfortable. But perhaps one that is similar to a tensor bandage would help ? I've seen some nice knee pads that can be used specifically for gardening. In fact, my mother has one that she uses. They are typically made out of strong foam and can be purchased at garden stores I believe. At what point do you go to the doctor with knee pain? When the pain has been around for a while or immediately? Does immediate intervention from a physiotherapist increase the changes of full recovery? I am a firm believer in consulting with a physician at any time when the individual is concerned s/he is not recovering from the knee pain. That may be sooner for some and later for others, depending on so many variables. Will icing the joint help with knee pain as a result of gardening, hiking etc?